This week we will read about plagues #8, 9 and 10. Of these, as well as the ones we read about last week, #9 has a unique quality. It afflicts the mind rather than the body. This time, no hailstones will pelt the Egyptians, no lice will bite them, no frogs will overrun their country. This time they will get a blackout. The Torah describes it as darkness so thick you could feel it. For three days and nights, people could not see each other. They were afraid to move. How did Moses manage this? According to some historians, maybe he didn’t. They tell us this was an actual total eclipse of the sun which took place on March 13, 1335 BCE. Perhaps that’s why Moses didn’t warn Pharaoh in advance the way he did before some of the other plagues. The Or haHayyim (Light of Life) commentary takes a spiritual approach. Suppose a word is missing from the sentence about the Israelites having light. Just a little word, asher, translated “which, or who, or that,” as sometimes happens elsewhere in Scripture. Then the sentence would read: “The Israelites who had light were in the dwellings.” Meaning that those Israelites who went to Egyptian dwellings brought their light with them! Evil people cover themselves in darkness, as did the wicked Egyptians. But tzadikim — the righteous — experience Divine light “like the sun in all its power.” G-d loans them some of that light, so they can have light in their dwellings. And they can bring it with them to other dwellings. They had no Harry James to play it or Kitty Kallen to sing it, but some of the Egyptians that the Israelites visited in those days surely found themselves Beginning to See the Light! Had to. A couple of chapters further in this week’s reading, we will find out about the “mixed multitude – eyrev rav” who left Egypt with the Israelites. Who were they? Presumably dissatisfied Egyptians, glad to leave Pharaoh’s tyranny. No doubt some of them received light in their darkness from their slave neighbors, during the Blackout of the Ninth Plague. Like the scholars and scientists and entrepreneurs in modern Israel, those ancient tzadikim brought their light to their neighbors. Even though they were working for the Egyptians – not providing jobs for today’s Arabs – the light of Truth was with them. 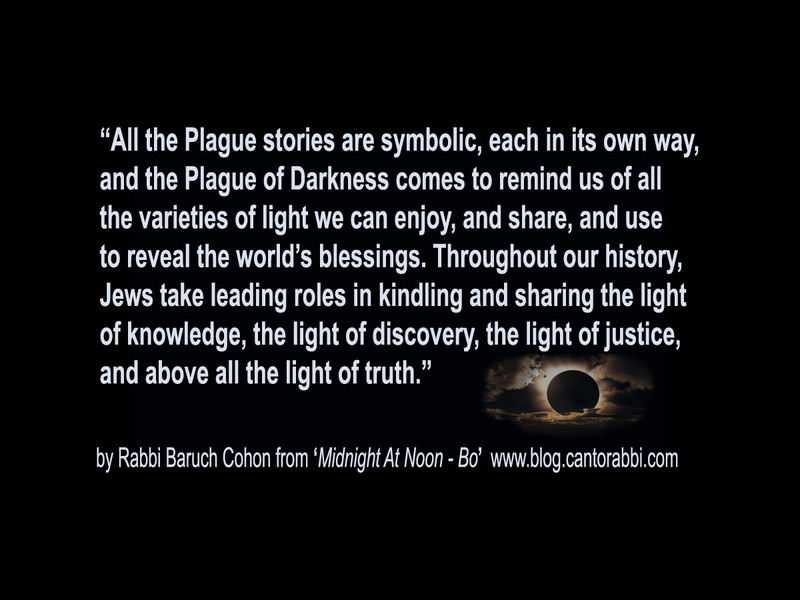 All the Plague stories are symbolic, each in its own way, and the Plague of Darkness comes to remind us of all the varieties of light we can enjoy, and share, and use to reveal the world’s blessings. 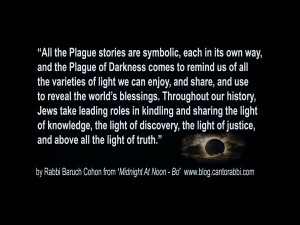 Throughout our history, Jews take leading roles in kindling and sharing the light of knowledge, the light of discovery, the light of justice, and above all the light of truth. Let’s hope we always will. 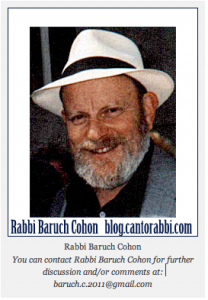 This entry was posted in Jewish Blogs and tagged Bo, Egypt, Exodus, Israel, jewish, Jewish Blogs, Light, Light of Life, LY'Lah, l’khoL b’neY yisroeL hayaH, Moses, Or haHayyim, Plagues, Rabbi Baruch Cohon, Sun, The Klee Yokor, Torah, Torah Blogs, Torah Study, tzadikim, Vessel of Value. Bookmark the permalink. We had a plague similar to this in San Pedro a few weeks ago, but it turned out to be a power outage. It was scary!